Bisphenol A (BPA) is a monomer that is used in the production of polycarbonate plastics. Polycarbonate plastics are used to manufacture a lot of common consumer goods, including eating utensils. The voltammetric behavior of BPA has been investigated using a modified carbon paste electrode in a Britton–Robinson (BR) buffer. 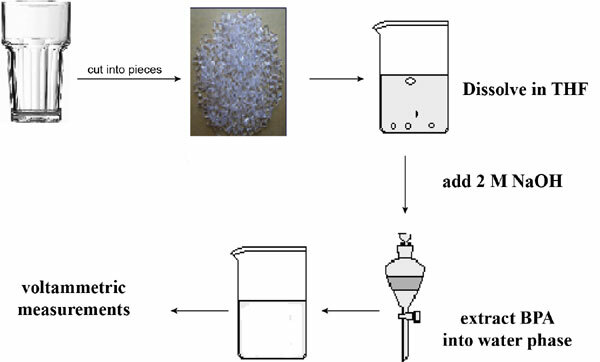 A rapid quantitative determination of BPA in polycarbonate products due to an incomplete polymerization reaction has been examined using cyclic voltammetry and differential pulse voltammetry at a modified carbon paste electrode. The optimum voltammetric response was achieved in a pH 9 BR buffer. Additions of BPA using a quantitative voltammetric determination exhibited a linear detection range between 1.0x10-8 M and 2.7x10-4 M BPA. The limit of detection and the limit of quantification were found to be 1.1x10-9 M and 3.7x10-9 M, respectively. The method developed was successfully applied to the determination of BPA content of real samples. Keywords: Bisphenol A, cyclic voltammetry, differential pulse voltammetry, modified electrode, poly carbonate, electrode. Keywords:Bisphenol A, cyclic voltammetry, differential pulse voltammetry, modified electrode, poly carbonate, electrode. Abstract:Bisphenol A (BPA) is a monomer that is used in the production of polycarbonate plastics. Polycarbonate plastics are used to manufacture a lot of common consumer goods, including eating utensils. The voltammetric behavior of BPA has been investigated using a modified carbon paste electrode in a Britton–Robinson (BR) buffer. A rapid quantitative determination of BPA in polycarbonate products due to an incomplete polymerization reaction has been examined using cyclic voltammetry and differential pulse voltammetry at a modified carbon paste electrode. The optimum voltammetric response was achieved in a pH 9 BR buffer. Additions of BPA using a quantitative voltammetric determination exhibited a linear detection range between 1.0x10-8 M and 2.7x10-4 M BPA. The limit of detection and the limit of quantification were found to be 1.1x10-9 M and 3.7x10-9 M, respectively. The method developed was successfully applied to the determination of BPA content of real samples.